The Iron Horse V2 is a return to the classic distortion: thick, punchy, riffy and rowdy. The true bypass, high gain behemoth has been updated to help steer the stallion or let the reigns loose for full on distorted onslaught. Dial back the gain and it can be used as a thick, warm overdrive. 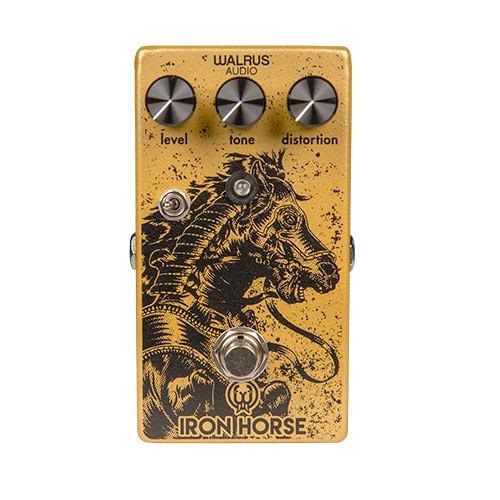 The Iron Horse has three distortion modes operated by a toggle switch that changes between different clipping diodes providing more versatility in shaping the tone of the distortion. Left will give some compression. Right will give you a higher amount of compression and middle will give you a wide open, non compressed signal. – Updated the Level control so that it is easier to dial in unity gain. – Updated the Tone control to allow more treble to be dialed in if desired. – Updated Distortion control to smooth out the range of distortion making it easier to dial in lower gain tones.